BUY THIS KIT NOW TO SOLVE YOUR RFI/EMI ISSUES - WORKS WITH MANY BRANDS OF HAM/COMMERCIAL HF RADIOS. Deluxe RFI Filter Kit for HF Radios with multiple antennas, computer interfaces, audio I/O lines. on filters for I/O cables covering RFI range of 1-300 MHz. Quick installation - immediate RFI/noise reduction. No radio mods required. 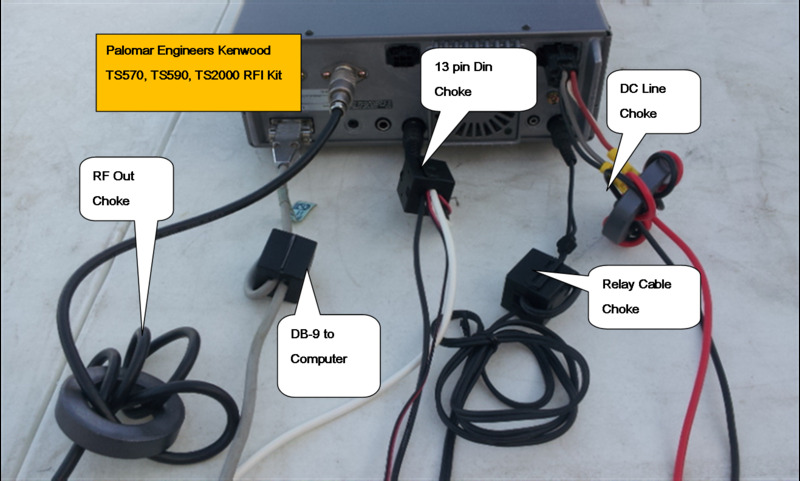 The RFI kit is designed to be installed on your radio transceiver to reduce Radio Frequency Interference (RFI) caused by common mode current on the outside of the coax braid at the output of your radio and AC/DC power cable. Additional chokes are included to reduce common mode currents on 3 more transceiver cables including computer control, audio and another. Kit includes 4 large ferrite rings (1.4" ID) for RF antenna connectors, AC or DC input, large connector cables. 10 snap on (1/2" ID) connectors for computer interface, band switching, rotor control, and other cables. If you use a linear amplifier buy an amplifier RFI kit for additional RFI interference suppression.